Frank Herbert's Dune ended with Paul Muad'Dib in control of the planet Dune. Herbert's next Dune book, Dune Messiah, picked up the story several years later after Paul's armies had conquered the galaxy. But what happened between Dune and Dune Messiah? How did Paul create his empire and become the Messiah? Following in the footsteps of Frank Herbert, New York Times bestselling authors Brian Herbert and Kevin J. Anderson are answering these questions in Paul of Dune. The Muad'Dib's jihad is in full swing. His warrior legions march from victory to victory. But beneath the joy of victory there are dangerous undercurrents. Paul, like nearly every great conqueror, has enemies--those who would betray him to steal the awesome power he commands. . . .
And Paul himself begins to have doubts: Is the jihad getting out of his control? Has he created anarchy? Has he been betrayed by those he loves and trusts the most? And most of all, he wonders: Am I going mad? 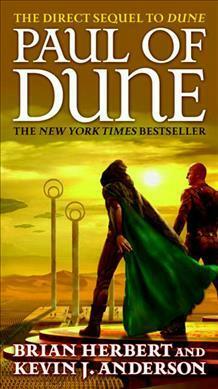 Paul of Dune is a novel everyone will want to read and no one will be able to forget. Brian Herbert, the author of numerous novels and short stories, has been critically acclaimed by leading reviewers in the United States and around the world. The eldest son of science fiction superstar Frank Herbert, he, with Kevin J. Anderson, is the author of Hellhole and continues his father's beloved Dune series with books including The Winds of Dune, House Atreides, Sandworms of Dune, among other bestsellers. He also wrote a biography of his father, Dreamer of Dune. Herbert graduated from high school at age 16, and then attended U.C. Berkeley, where he earned a B.A. in Sociology. Besides an author, Herbert has been an editor, business manager, board game inventor, creative consultant for television and collectible card games, insurance agent, award-winning encyclopedia salesman, waiter, busboy, maid and a printer. He and his wife once owned a double-decker London bus, which they converted into an unusual gift shop. Herbert and his wife, Jan, have three daughters. They live in Washington state.